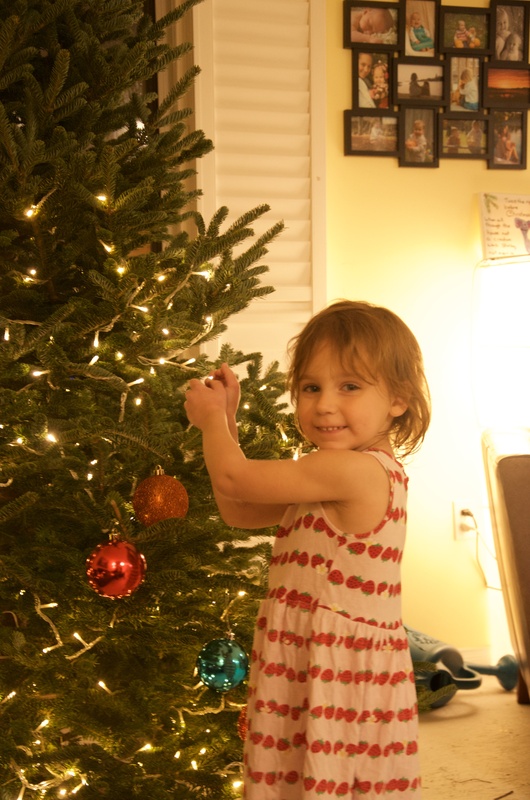 Getting the tree up and decorated is probably the most exciting part of getting ready for Christmas for the kids. 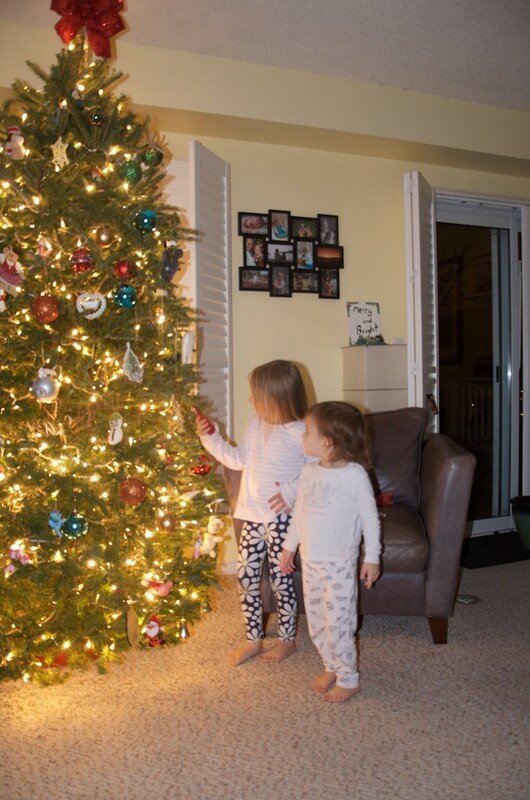 We get the tree and it sits in the stand for a few days to relax the branches and get a good drink, and then we get the big boxes out of the basement and the girls just can’t wait to see the lights and hang the decorations. We usually sing Christmas carols and have sugar cookies. 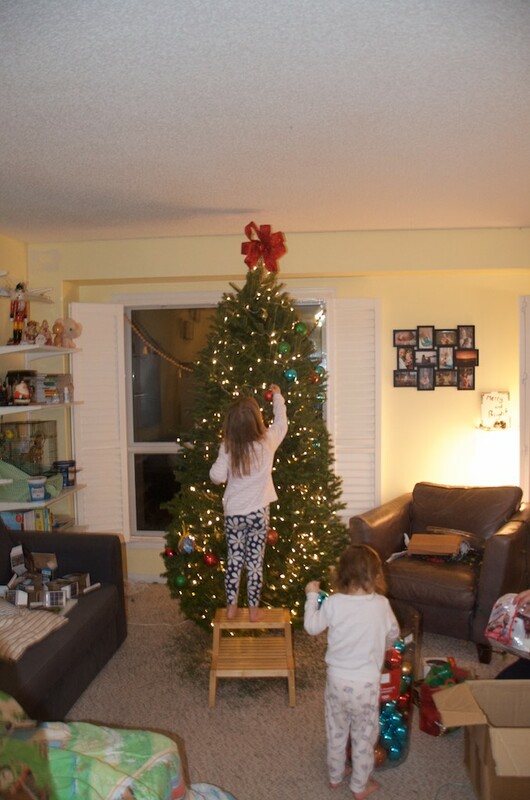 By the time it’s up and decorated, the girls are wired and it’s way past bedtime, but that is most fun. 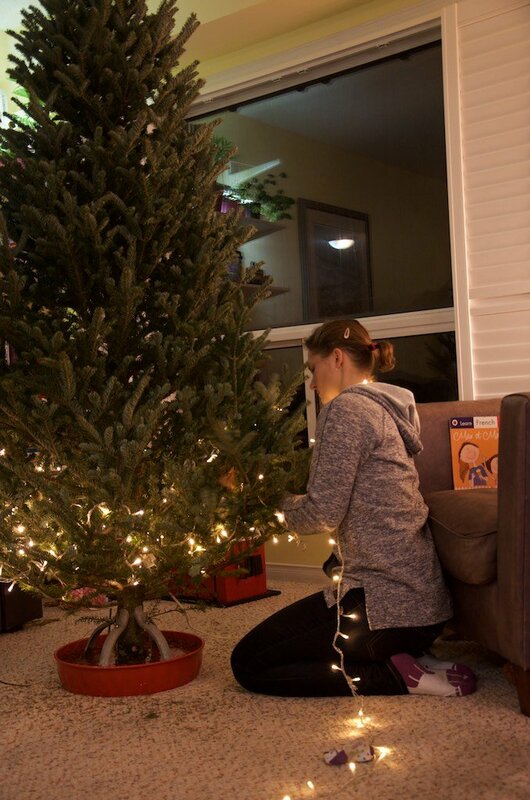 Getting the 900 lights on the tree. Starting to hang the decorations. unpacking the box is half the fun. 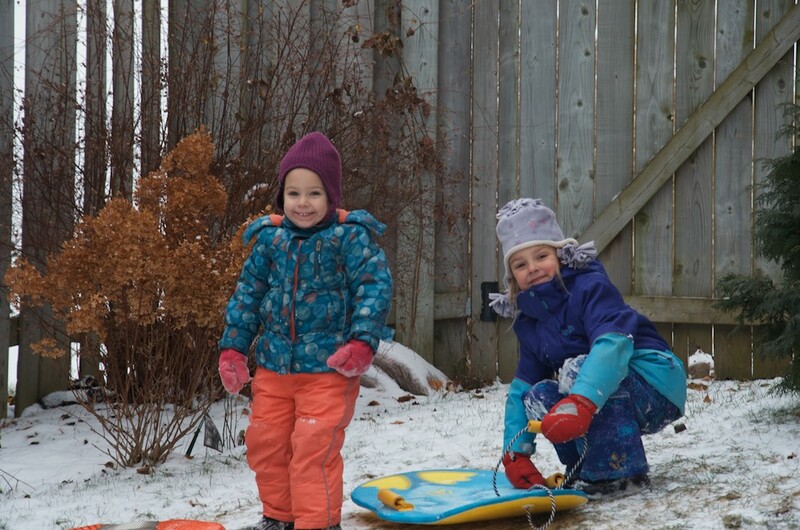 The girls are having so much fun with the snow that is ever so slightly starting to accumulate. 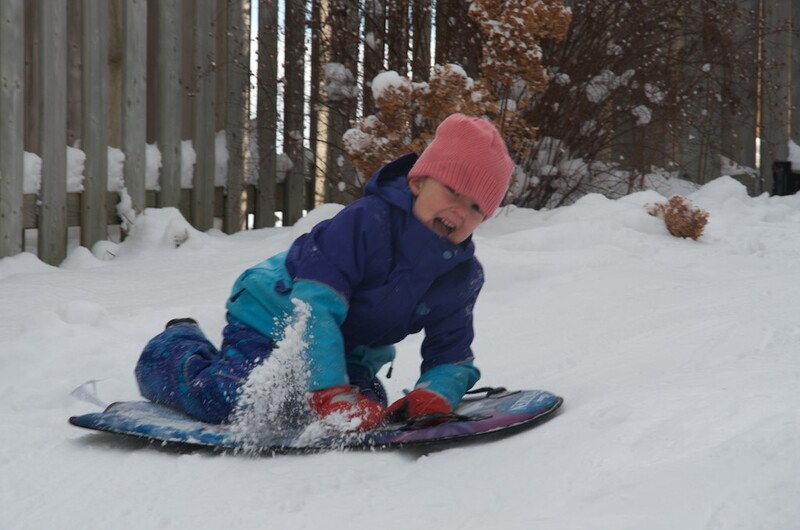 Tobogganing is great this year as Ava is finally able to get around in her snow suit without too much help and they can stay outside for much longer periods of time. 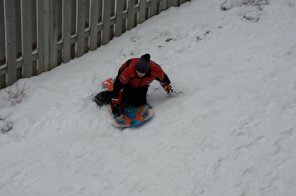 As much as I complain about driving in it, I love the excuse to go out and play in the snow! 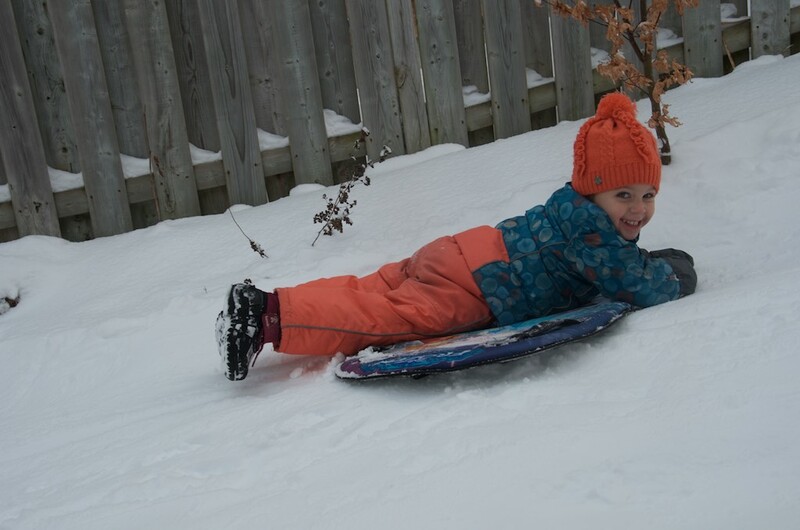 Building forts and sledding are some of my favourite things to do. 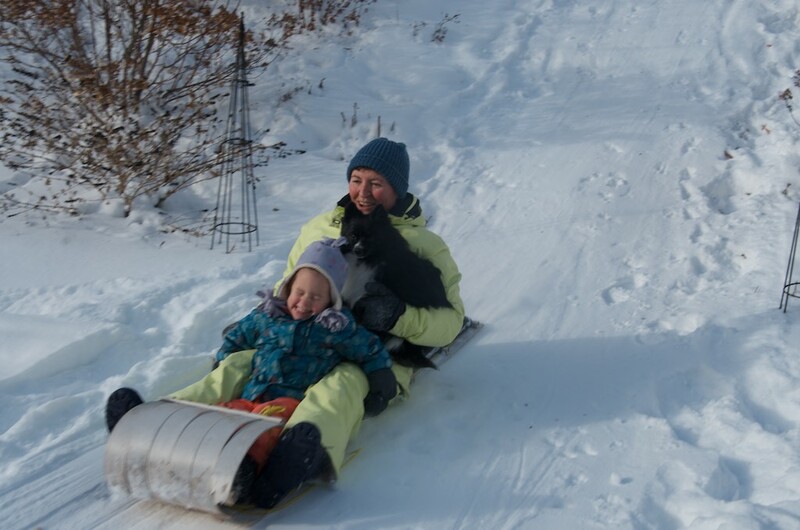 This year we have started making some small ramps on the hill to make us go a little further into the yard. 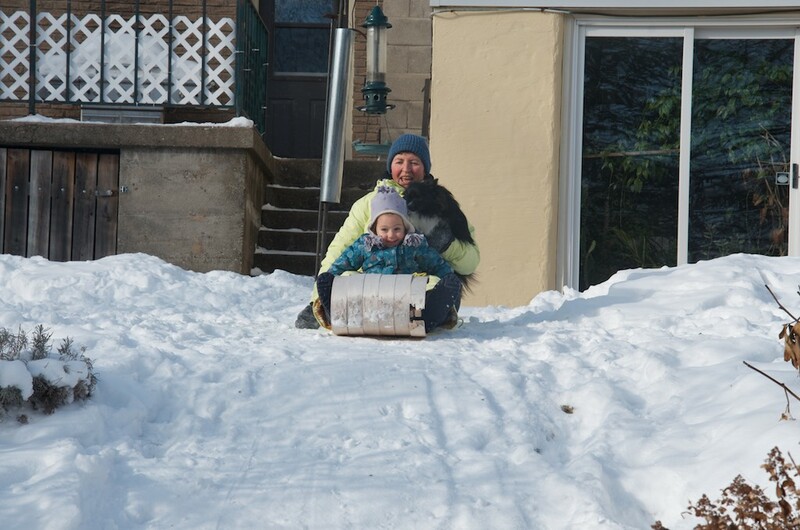 I am so happy that we have such a good hill in our own backyard. 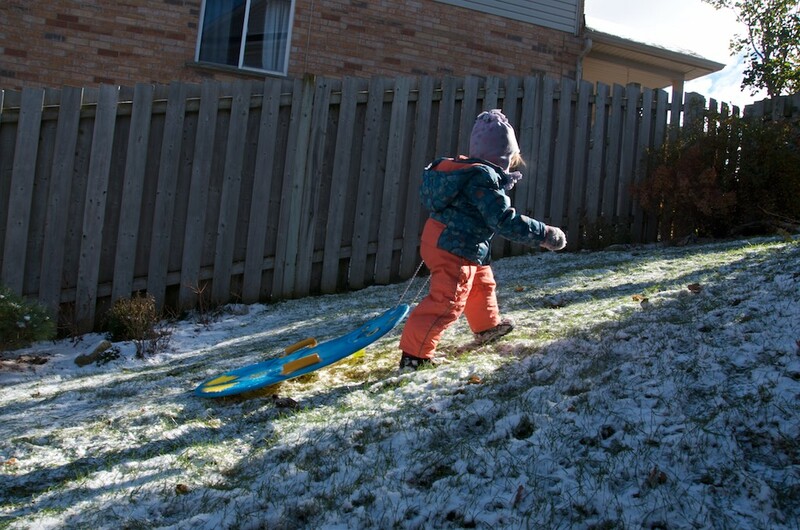 There may just be a sprinkling of snow, but we have to get the sleds out. 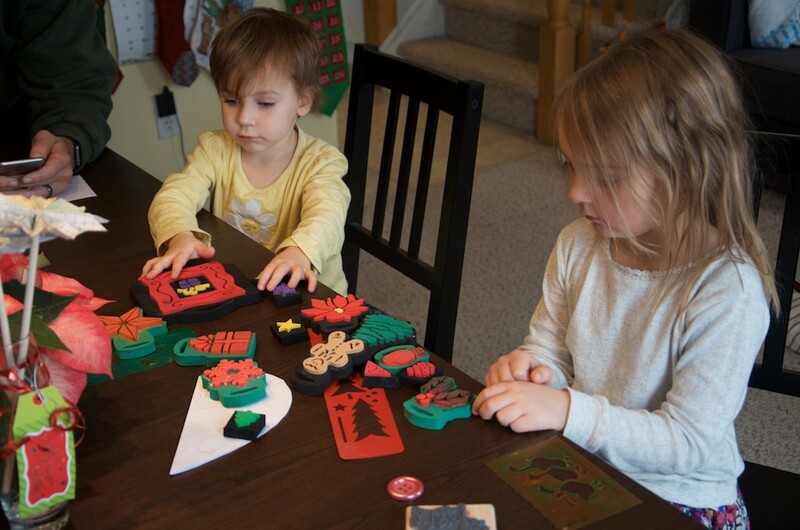 We have started doing so Christmas prep around the house, some baking, and some handmade Christmas cards. I had some friends over last weekend and we made some beautiful gingerbread houses, as well as some sugar cookies. 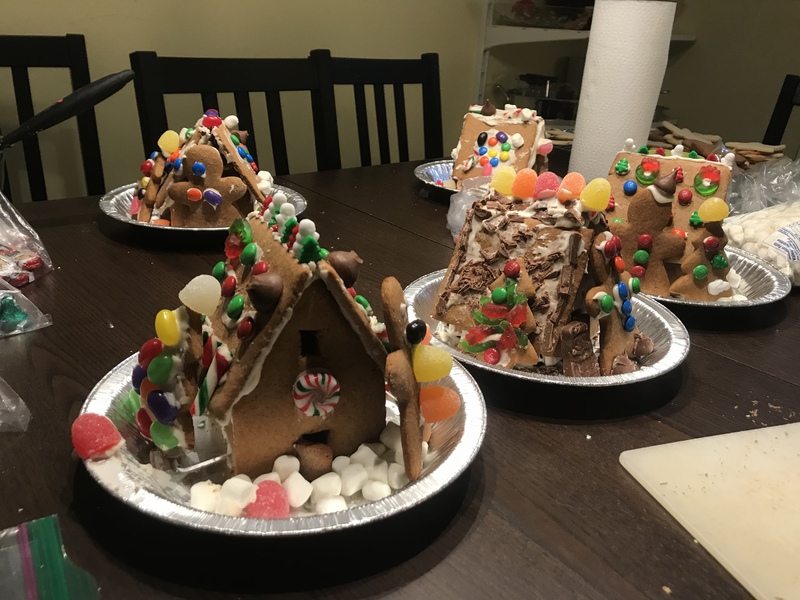 The girls really enjoyed building the houses and are slowly eating their way through houses. I fear some of the gingerbread boys and girls only have one leg or one arm. 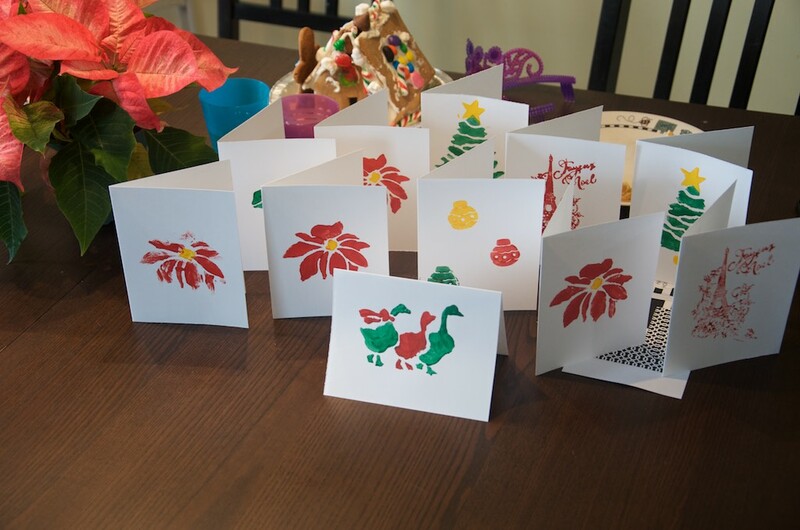 Our cards are drying and almost ready to send. 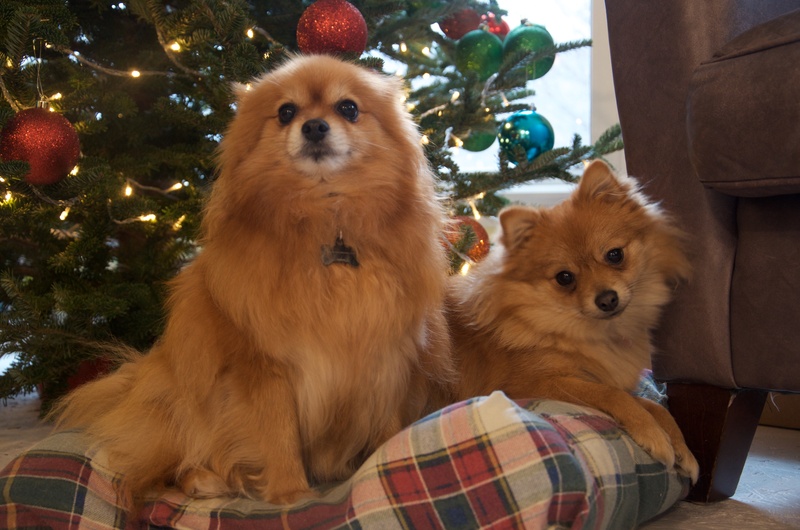 I finally got around to taking some Christmas photos of the girls. 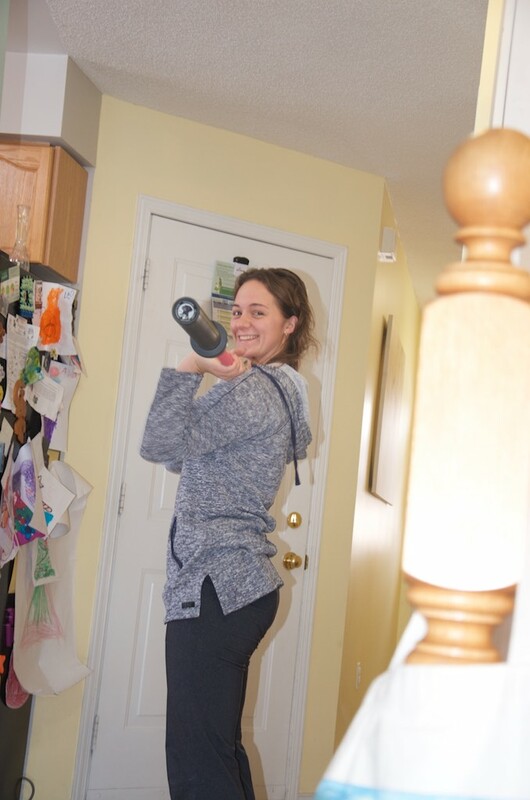 I am going to share one of the not so great ones as it is kind of funny and show that pictures I share are usually one of 50 or 100 that just didn’t turn out as well. 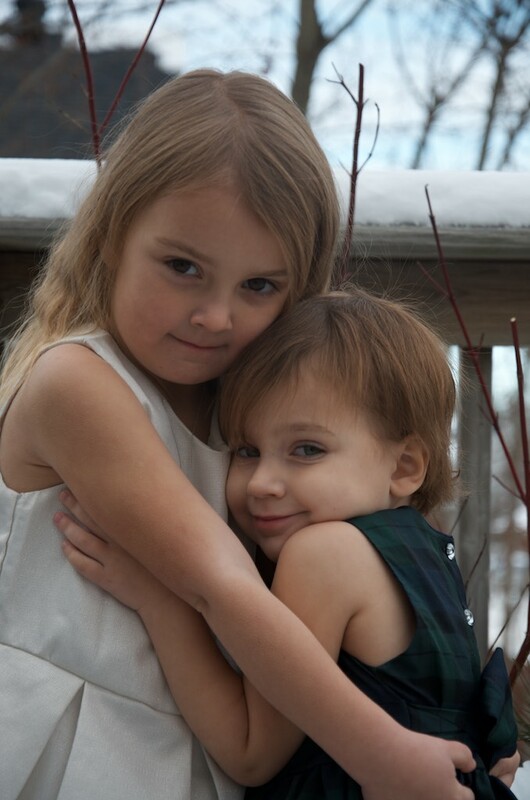 The girls Christmas photo for this year. 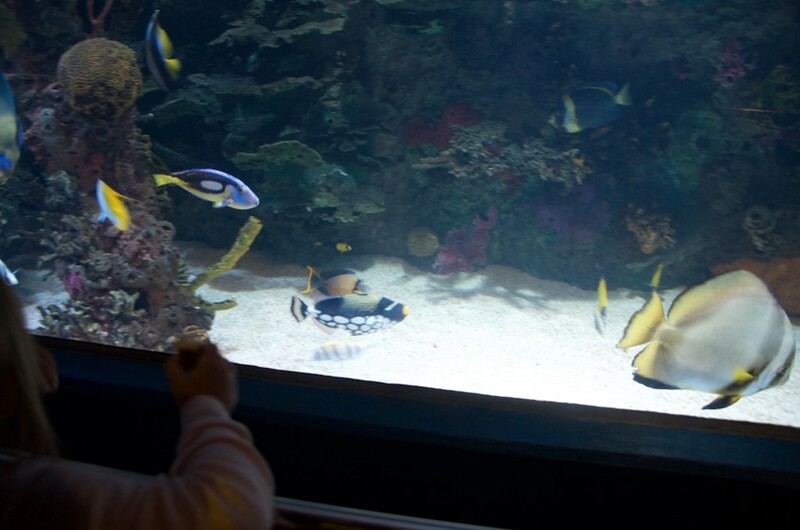 A trip to the zoo, and other stories. We have been busy as always since the last time I was able to check in. 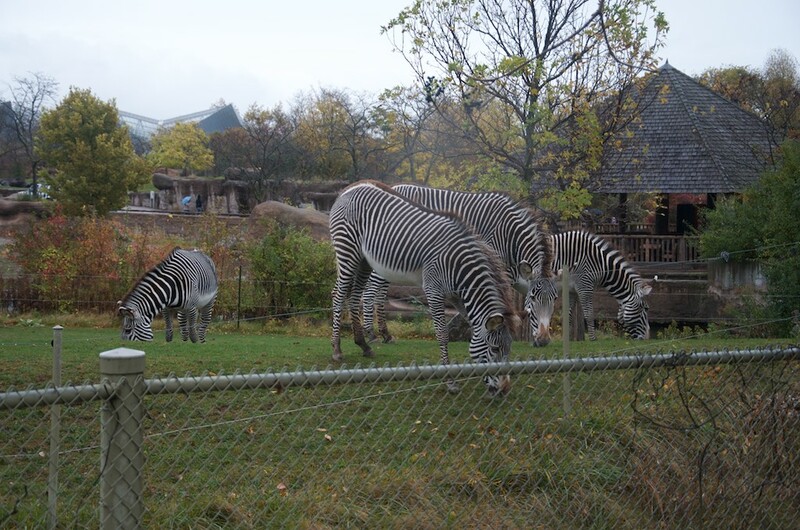 We made a family trip to the Toronto Zoo with my mom and dad. Going back as a guest was kind of strange after having spent many summers working with the pony ride, that appears to no longer be there. 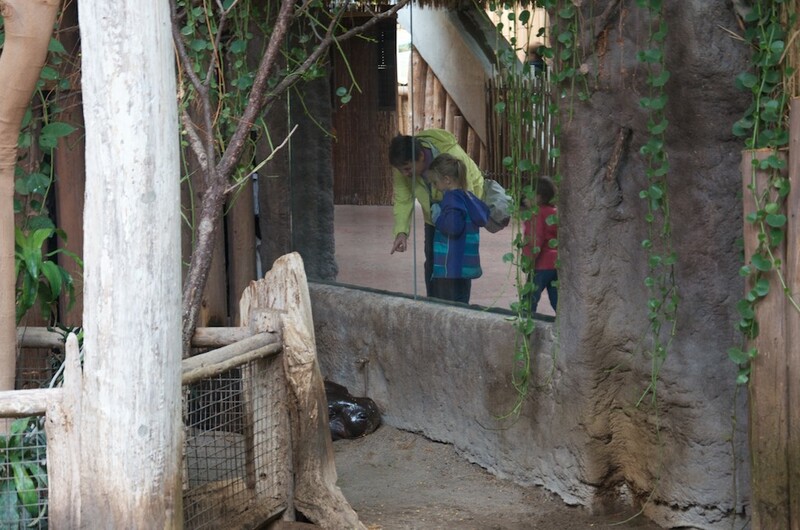 It was also so much fun watching the kids see all the animals for the first time.We packed a large picnic lunch and spent the whole day and saw pretty much everything. I forgot how big the zoo really was. Leah’s favourite animal turned out be the flamingos. 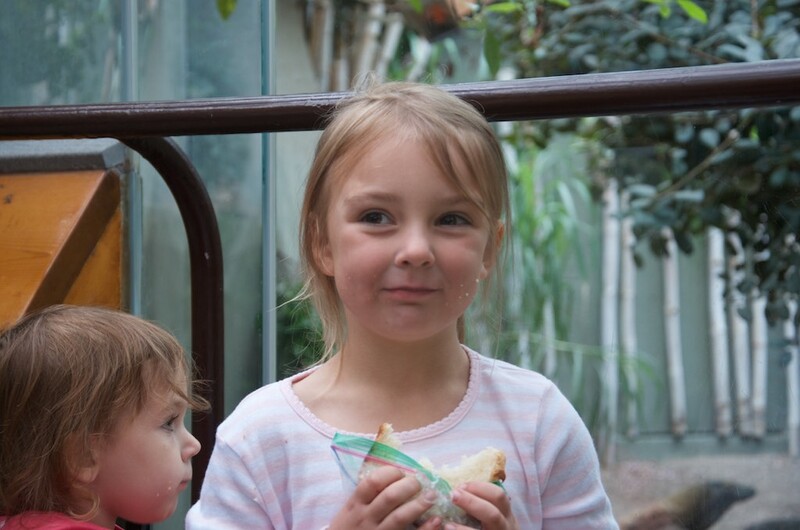 She also really liked seeing the giraffes and the tigers. 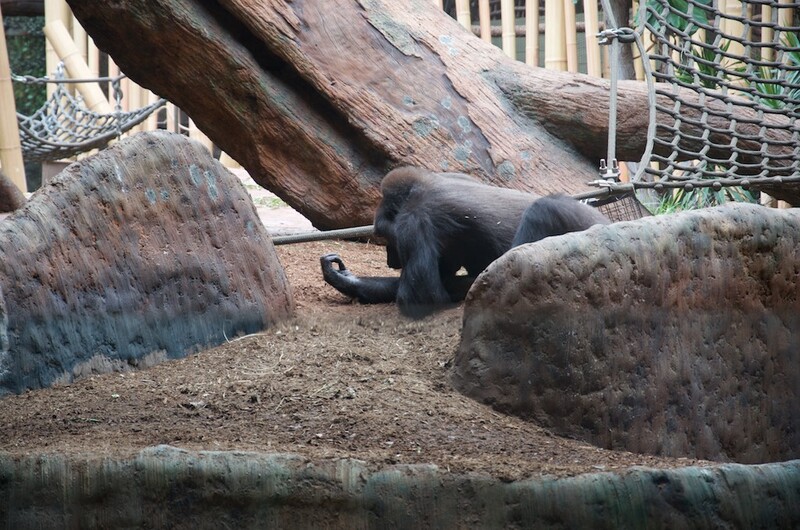 Ava’s favourite was the gorillas. 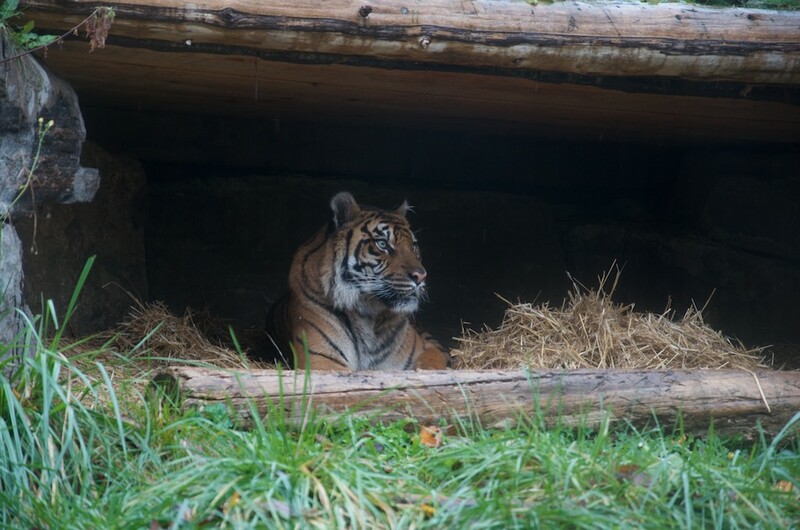 It was a cool wet day and many of the animals were very close and active. 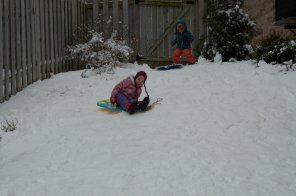 I am looking forward to taking the kids again maybe in the summer when it is a bit warmer. Leah having a bite to eat, the Komodo dragon was watching closely. 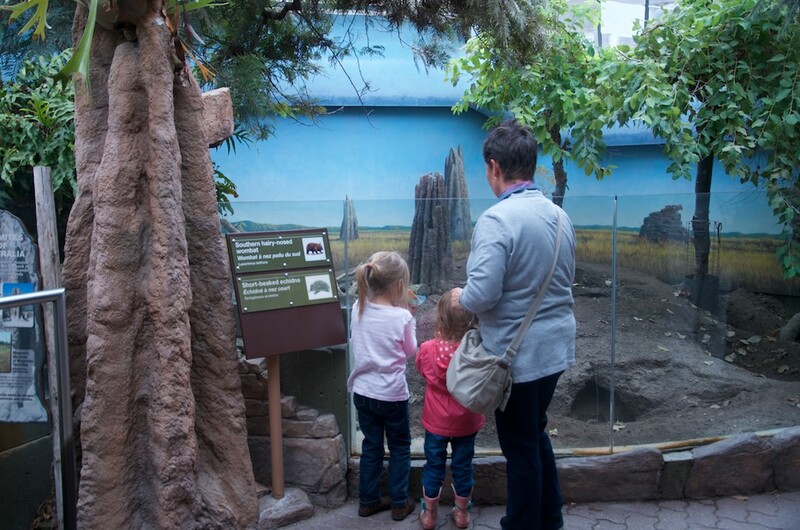 Leah, Ava and Granny checking out a pigmy hippo. Zebras up close and personal. 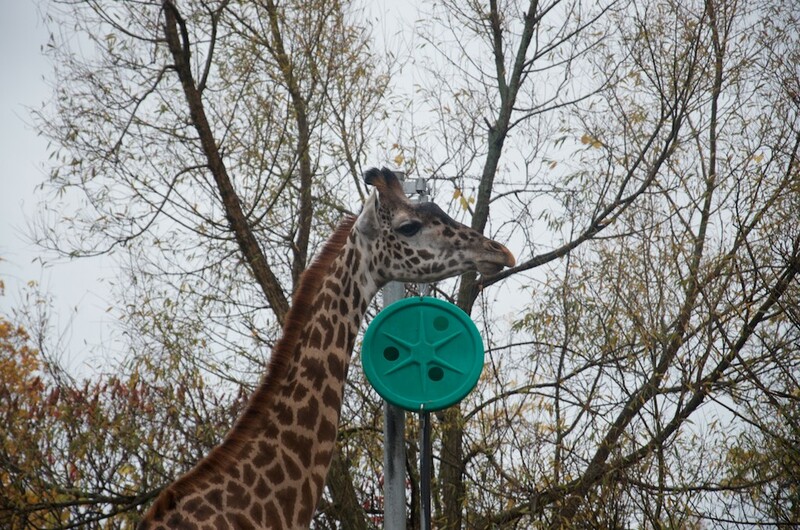 Giraffe! Leah asked the see these first. 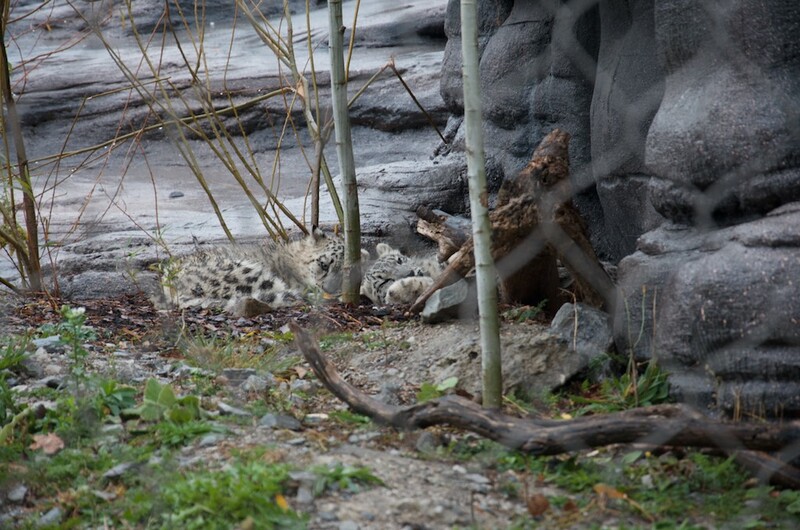 A pile of baby snow leopards. One of my favourites. Leah, Ava and Granny reading some signs. Halloween was also a a bunch of fun. 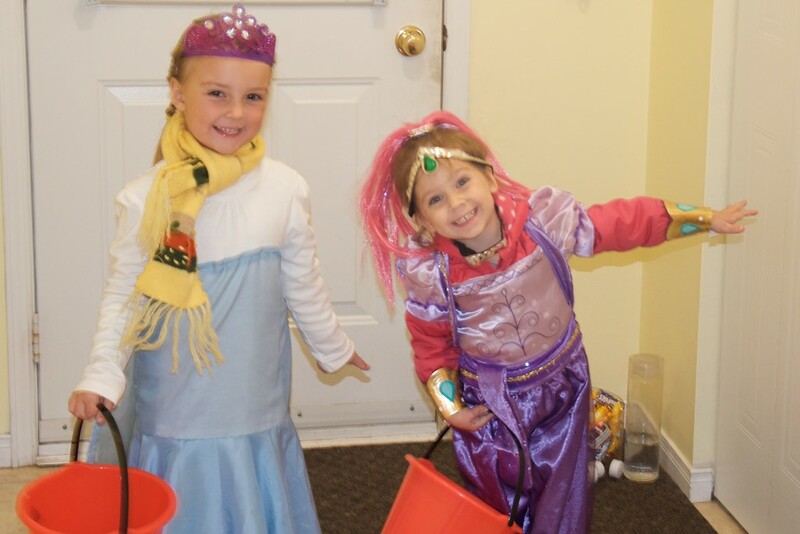 The girls enjoyed dressing up, Leah was Elsa again and Ava was a genie. Elsa and Shimmer. They couldn’t stand still. Thus, this is the best photo we got. Nick and I finally got most of the fall clean up done in the last week or so. It seems just in time to get the yard waste bags out for the last pick up. Also just in time as the first snow was upon us that evening. 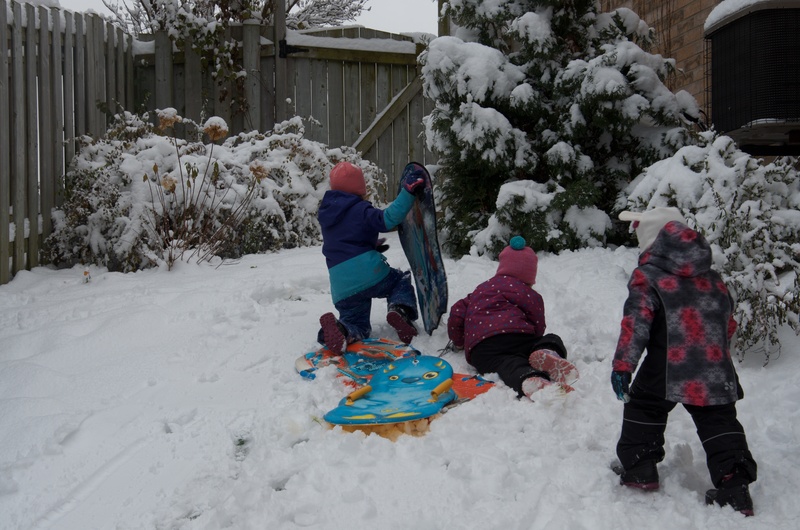 The girls were so excited about the snow they woke up early so that they could play outside before Leah went to school. 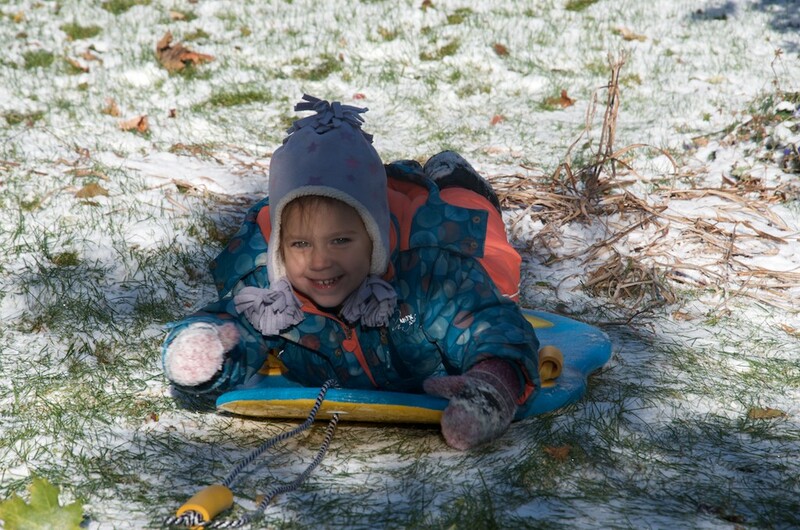 Ava enjoyed the first sled run of the season. The first run is always the best! Christmas is coming! 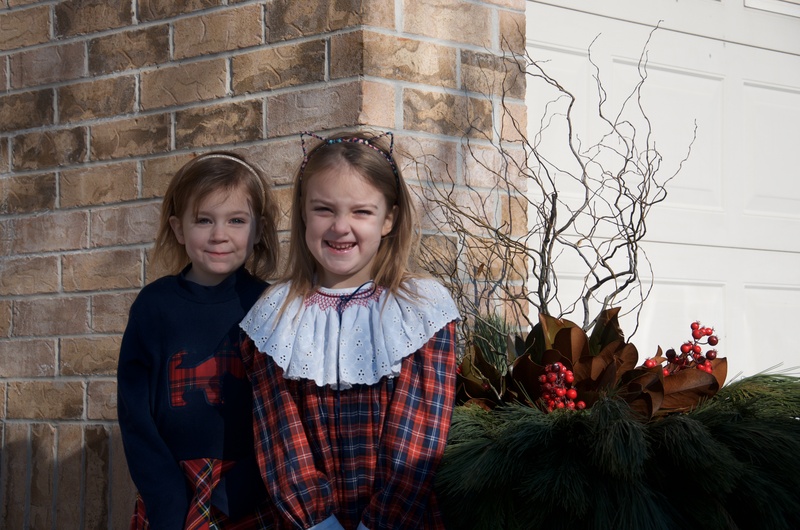 Having kids of a certain age has really made me enjoy celebrating the season a bit earlier. We got the lights up on the house outside and my dad came and built our winter planter. It is looking very festive. 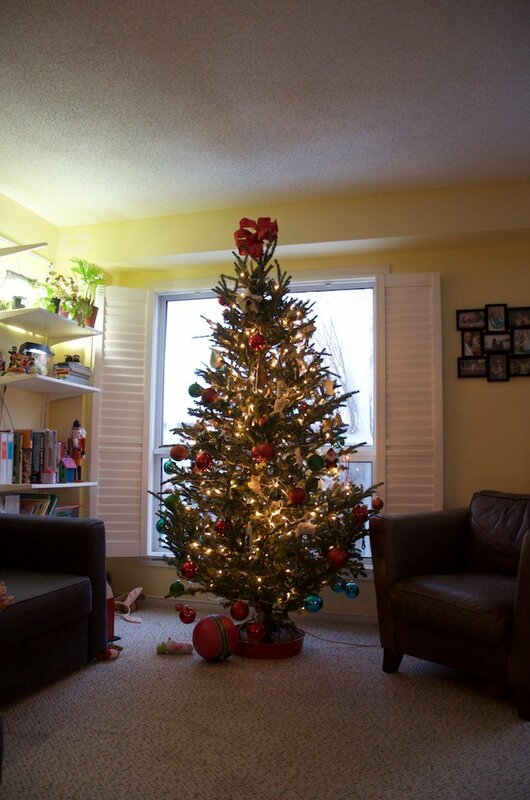 Our Christmas tree has also made an appearance. 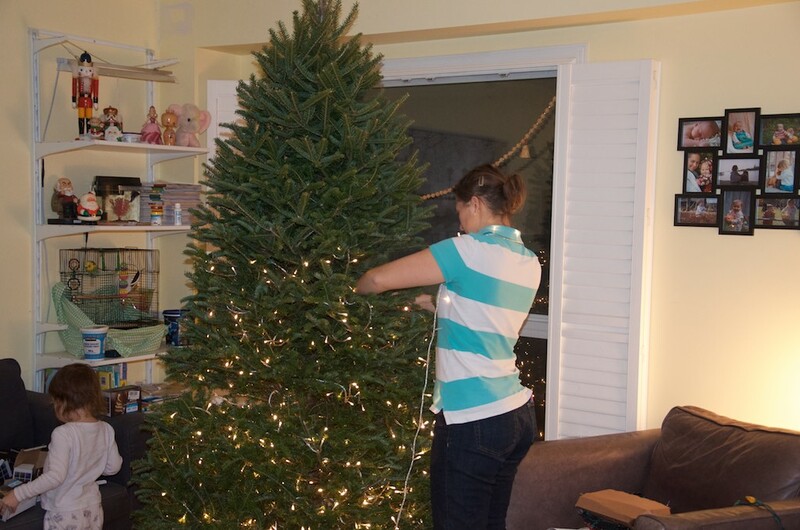 It will have to wait a few days until we can put any decorations on it and with that, the Christmas season is upon us. 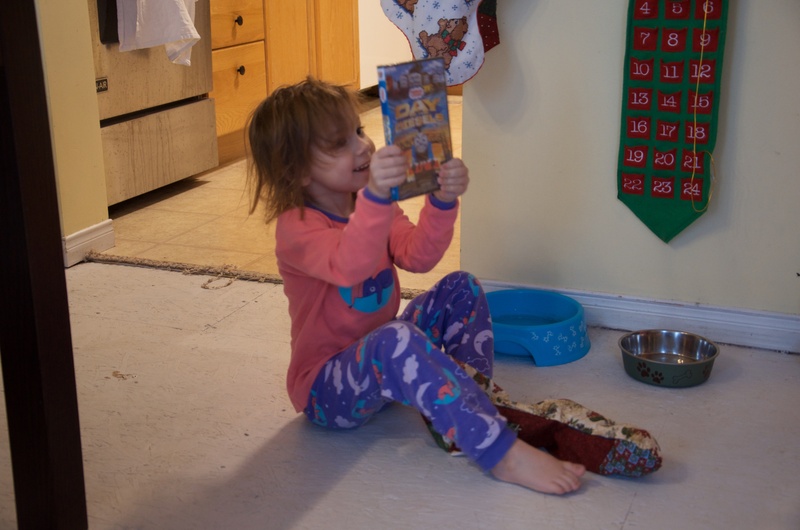 I have been busy making lists and planning various Christmas cooking expeditions for dad and I to embark on. The LCBO’s Food and Drink magazine always has so many fun and different recipes to try and play with. It is time to stock up on things before the mad rush at the end. I got some beautiful alpaca wool today, I have some projects in mind for that. Well, off to check out some cyber Monday deals. I’m sure it will be just as successful as black Friday i.e. nothing purchased. 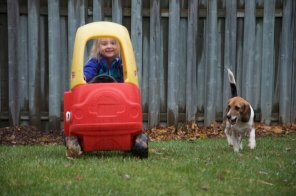 Author janamichaudPosted on 2017-11-26 2017-11-26 Categories christmas, Cooking, family, travel, UncategorizedTags animals, christmas, Cooking, family, halloween, Toronto ZooLeave a comment on A trip to the zoo, and other stories. The holidays are over and the new year has begun. The Christmas decor has been taken down, and as usual there is always one thing I forget to put away, this year it is a cushion cover. With the putting away of Christmas comes the purge of no longer useful to me things. I cleaned out the linen closet and got rid of some of my old clothes. I finally said goodbye to my prom dress, its only been sitting there for 10 years. Its very therapeutic. 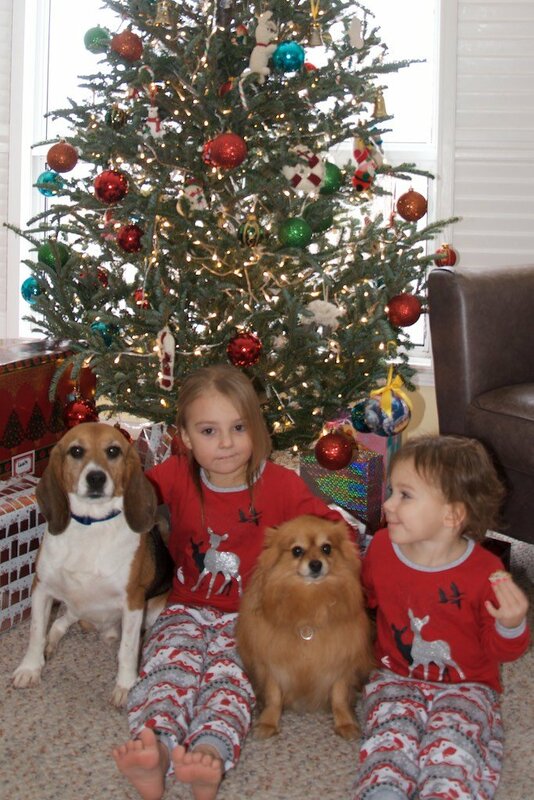 Hawk, Leah, Ginger and Ava in front of the christmas tree, It is so hard to get the to sit still! 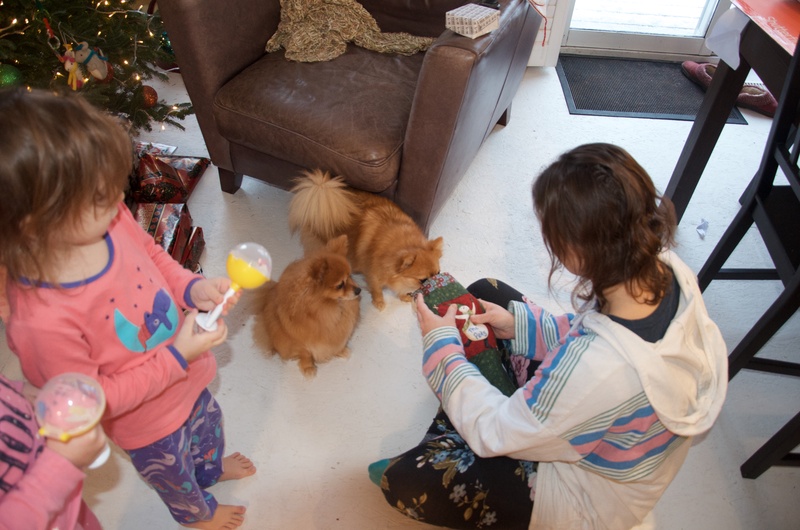 It also turns out that we really didn’t take many christmas photos over the holidays, its hard to remember to actually take the photos when you are involved with the all the gifts and interacting with the people. 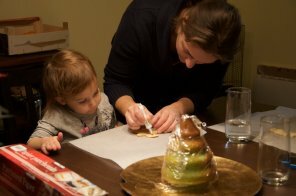 The girls enjoyed helping out with cookie decorating and cake baking. 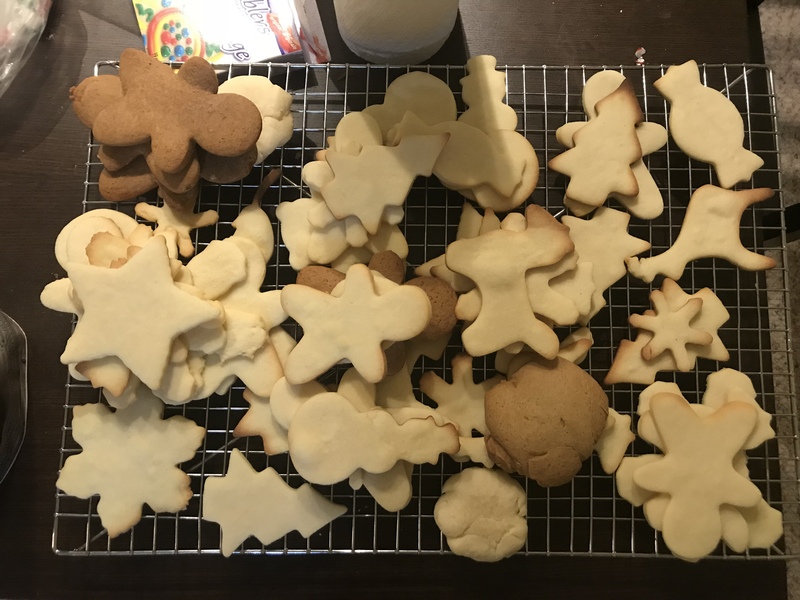 I love making sugar cookies this time of year. It just feels so festive and gets me right into the christmas spirt. We usually have christmas music playing while we bake and decorate! 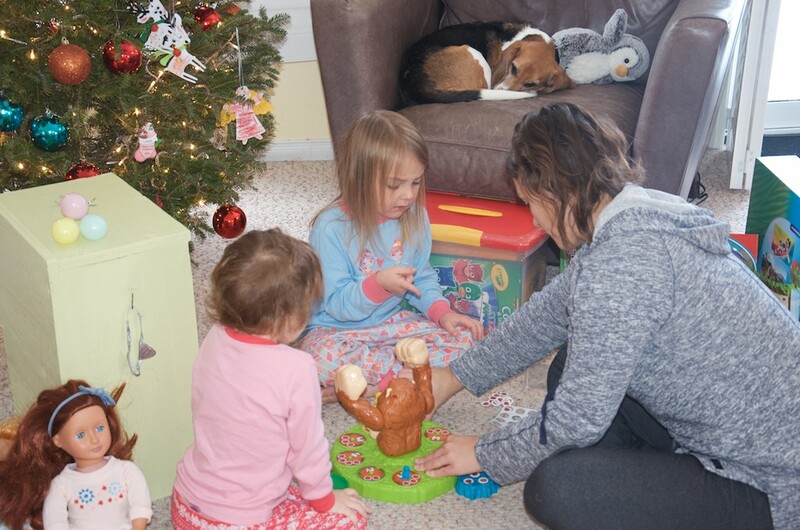 The winter weather has turned us to indoor activities. We got a wonderful set of Kapla blocks from my MIL. 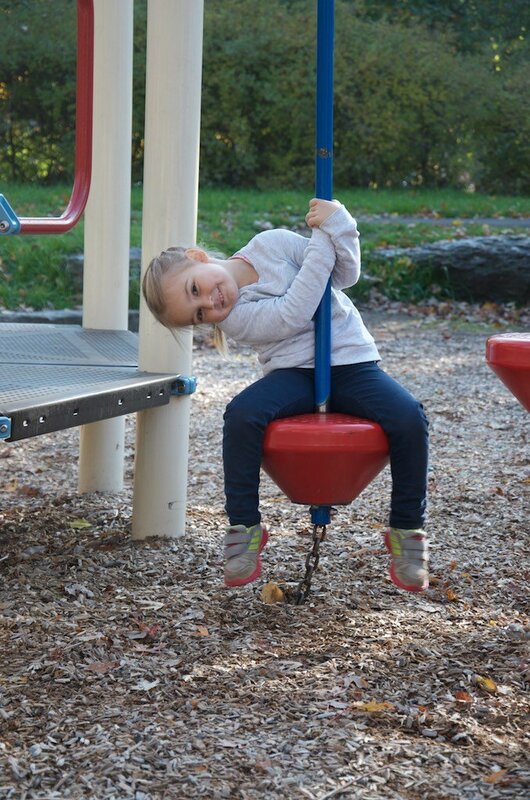 It is supposed to be for the kids, but I think I am having more fun with it right now. The blocks are all exactly the same size and the designs are really challenging and fun to topple over. 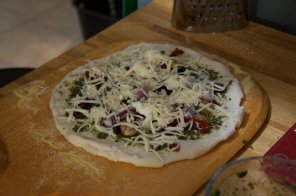 Nick has been working on his pizza creations, we got a second stone for christmas so we can cook two at once in the oven now. 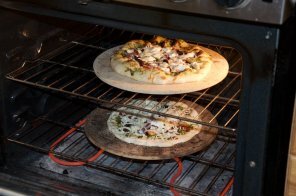 Two stones in the oven. The warm weather has me itching to get back into the garden. The seed catalog arrived a couple of weeks ago so the planning is in full swing. We got a mini greenhouse from my parents. I cant wait to set it up on the deck and get growing. Well thats all for now. Happy New Year to all! Wish all of you the best in the year to come! Finally a chance to sit down at the computer. 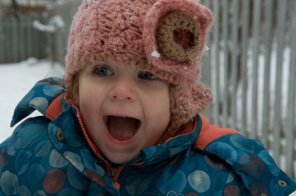 I am so happy that it is finally my weekend! 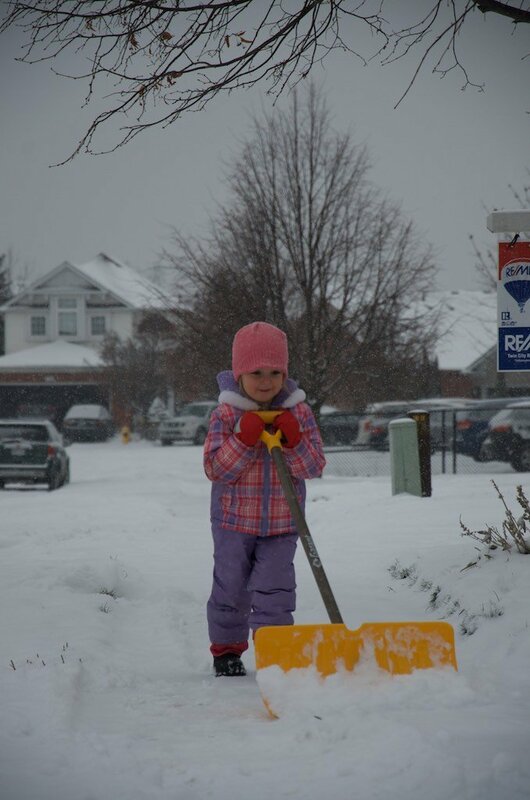 The weather this week has really got us thinking about how Canadian we are – who else checks the current road conditions and current weather statements before getting out of the bed in the morning? It was a nice change to not have to clean my car off this morning before work. 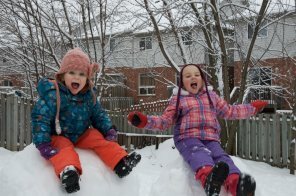 I didn’t make it to work on Saturday because of snow and road conditions, this unexpected day off thrilled the girls to bits. 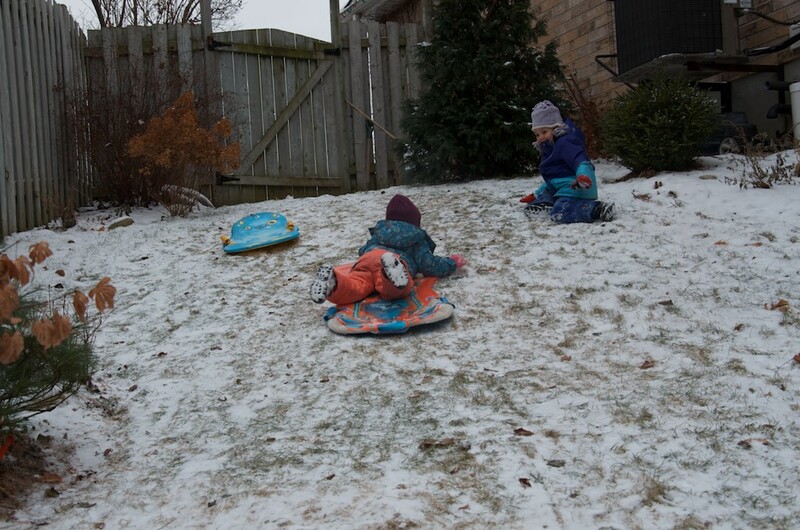 We spent the morning making an excellent toboggan run in the back yard, followed by a walking trip to the park, where the girls discovered bigger hills and that snow makes the slides a lot shorter. 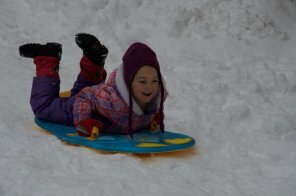 In the last week or two the weather has gotten colder and snowier. 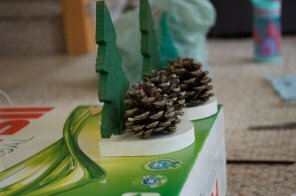 It is hard to spend as much time outside as we do in the summer, so I have been setting up more indoor projects. 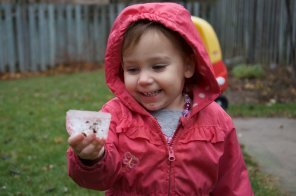 Before the real snow came, I made some simple homemade snow for the girls. 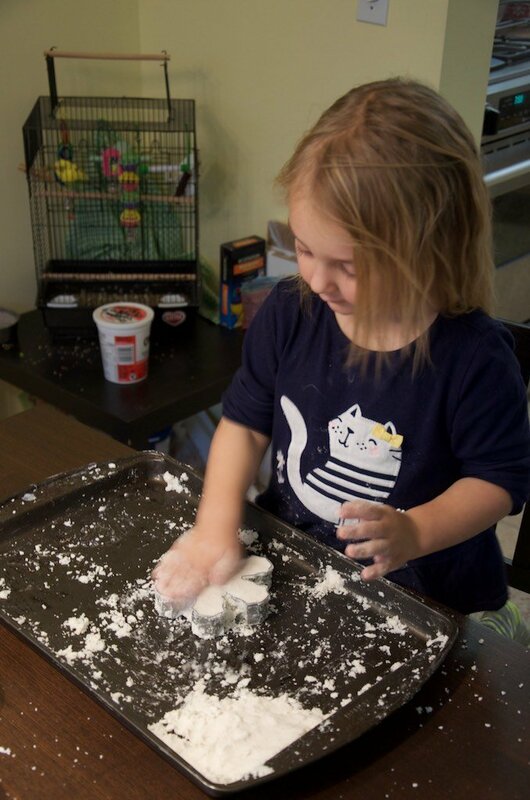 It is made with 1/2 cup hair conditioner and 2 cups baking soda. 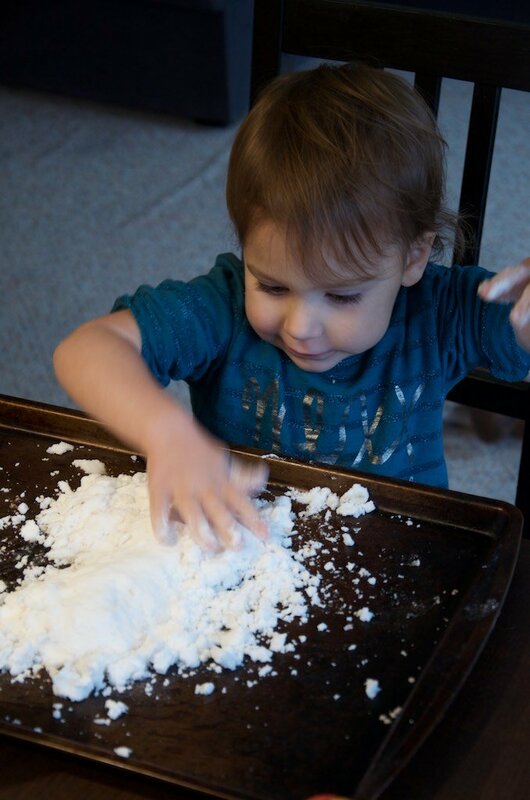 It has an endothermic reactions so it really feels like snow, and it packs and kind of rolls up like snow too. 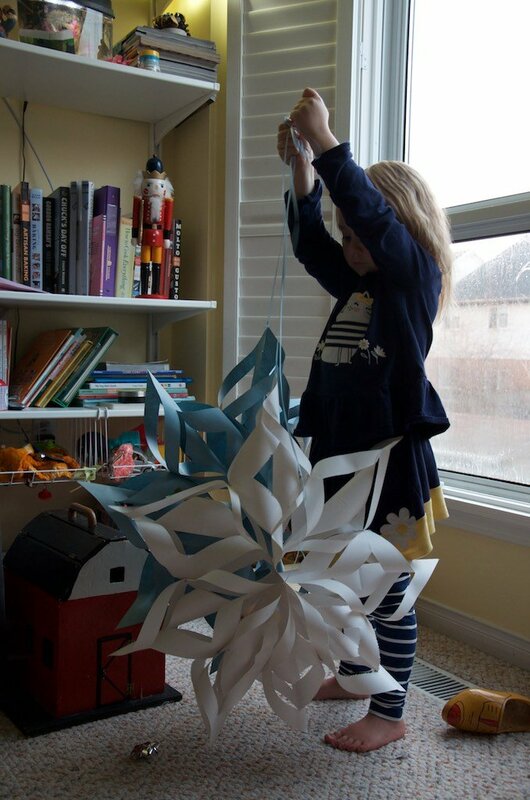 Leah and I made some paper snowflakes to hang in our front hall. These are one of my favourite crafts. They look awesome and really don’t take that much work to make. Link (http://www.craft-craft.net/christmas-ornament-paper-snowflake-tutorial.html) The only thing I change – and it’s merely for ease and time – instead of glue I use staples. 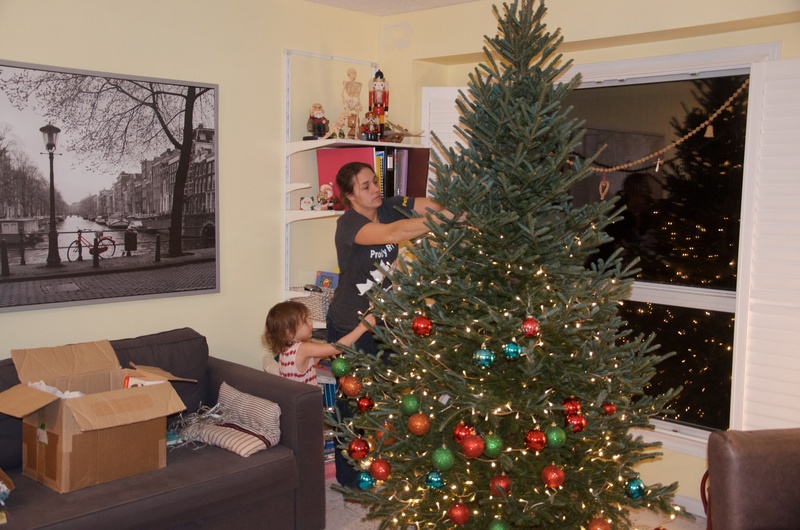 We got the tree up! 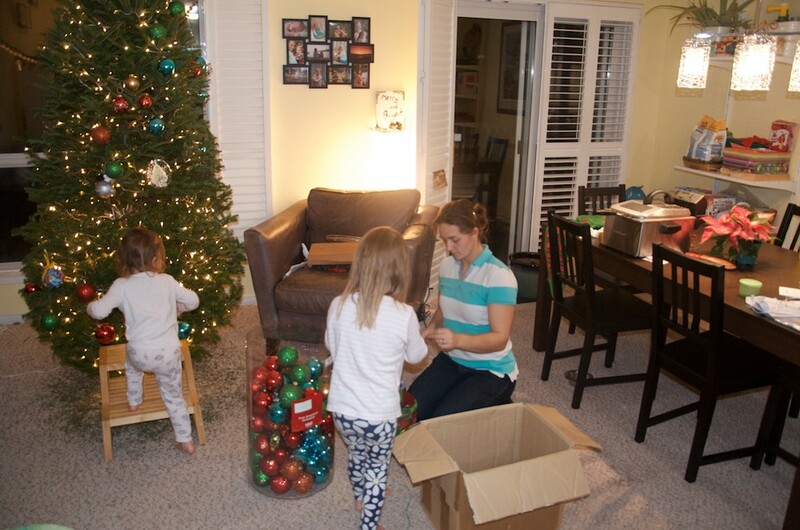 The girls love helping me dig out all the decorations and put everything on. 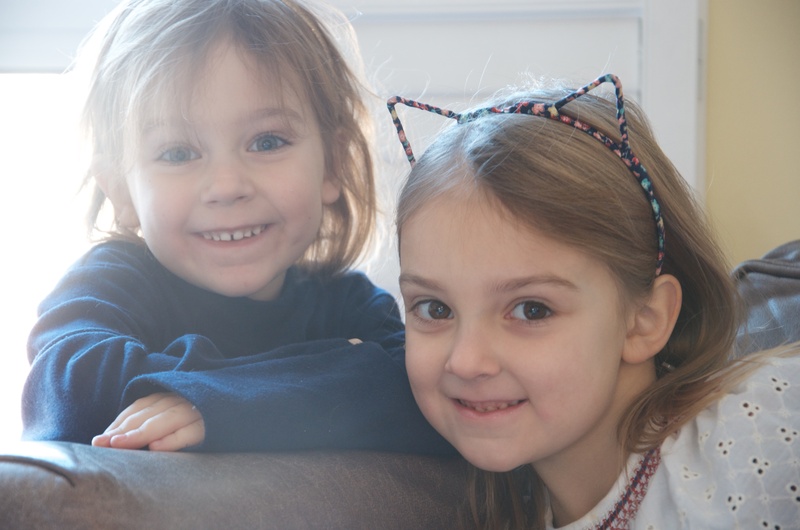 It is one of my favourite things to share with the girls. 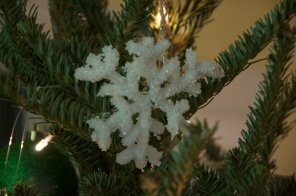 I remember going out with my mom to harvest all the evergreen for wreaths, swags, and garlands and the house would be filled with the fresh smells of pine, cedar, and fir. 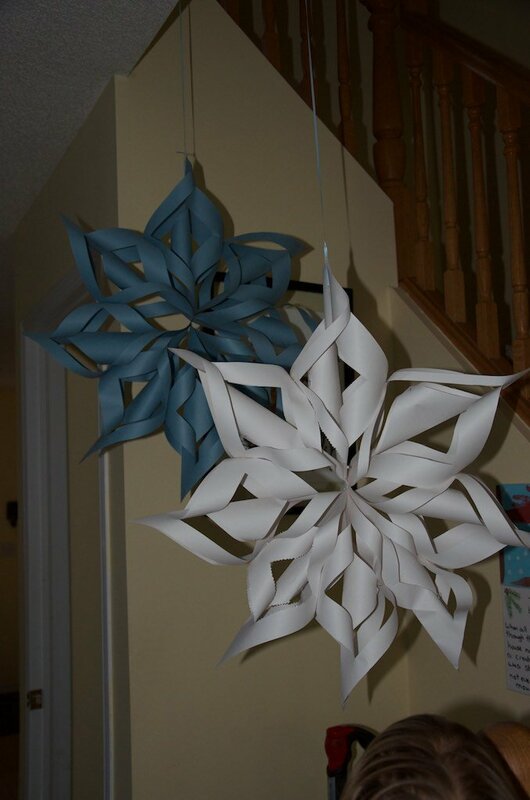 The one other project we did in the last couple weeks was making borax snowflakes. 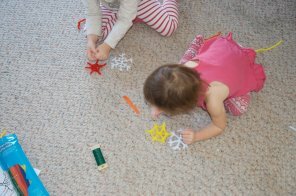 Theses were a simple craft that we could do all together and watch as the crystals formed on the pipe cleaner. 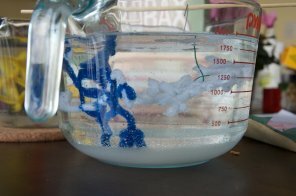 I mixed 1/3 cup of borax to 2 cups of water, I tried boiled water and just the hottest water out of the tap and both worked effectively, I found the tap water to work a bit faster. 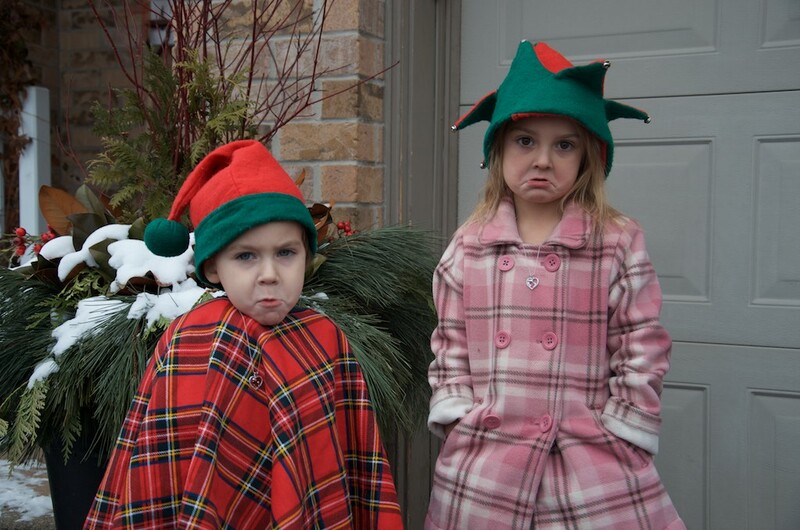 Its the final week before Christmas! I have sugar cookies to decorate and presents to wrap. 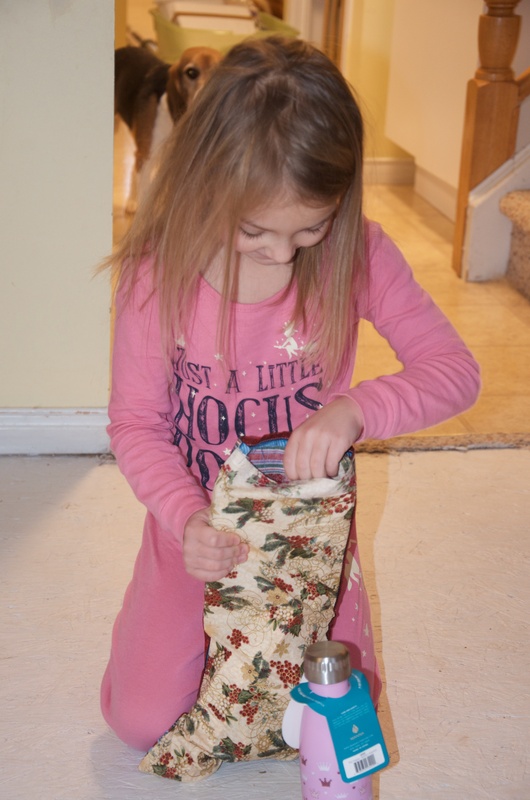 I can’t wait to see their smiling faces with the surprises that will be under the tree. I’m hoping to attempt a Buche de Noel. 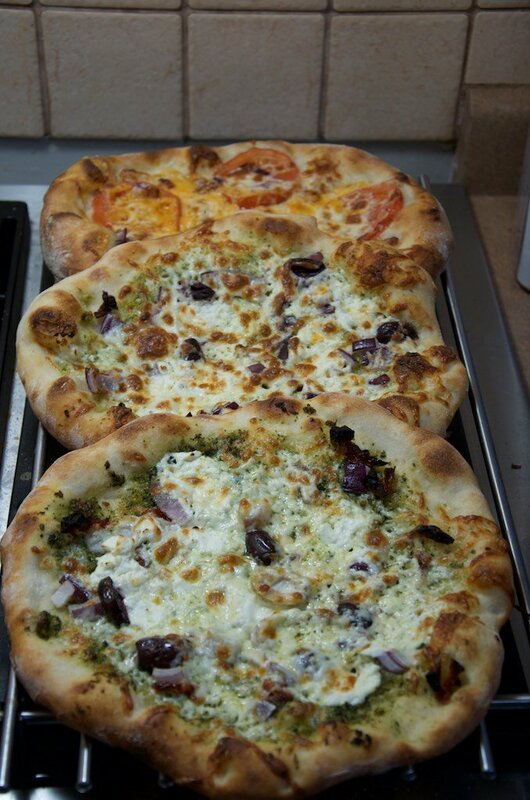 There is a recipe on Pinterest that has been catching my eye for a year or so and perhaps its time to try. The next time I get around to updating this, it will probably be after Christmas and probably after New Years. So I wish you all a very Merry Christmas, and all the best in the New Year! Well, November disappeared in a hurry. I still can’t believe how nice the weather has been. 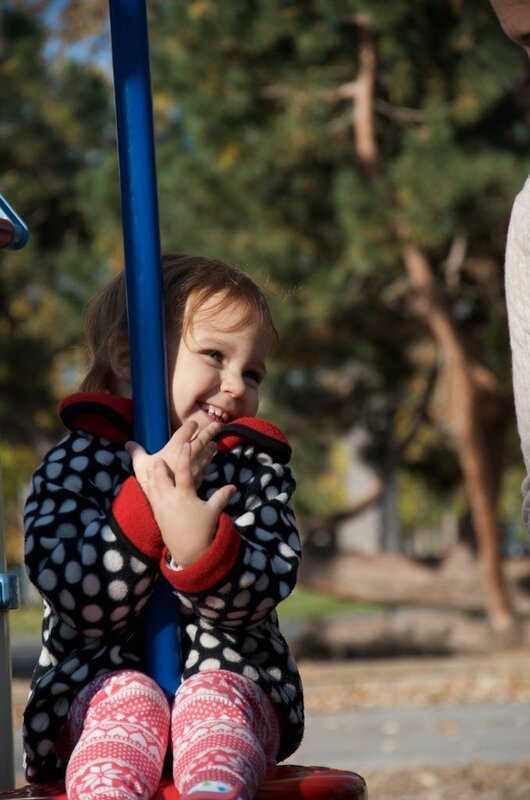 We spent as much time as we could outside. 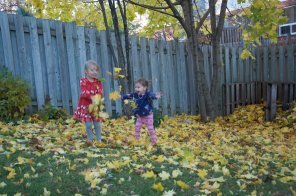 Leah and Ava really love the trees we have in back yard. 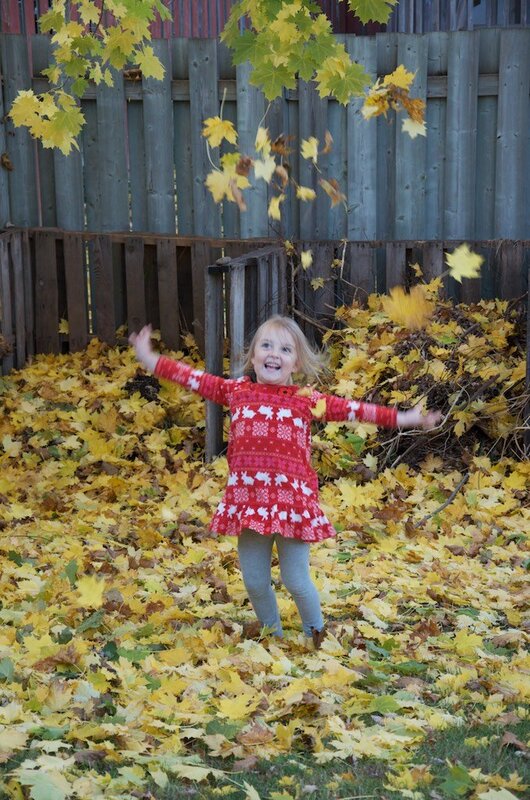 Playing in the giant leaf piles we make is so much fun. 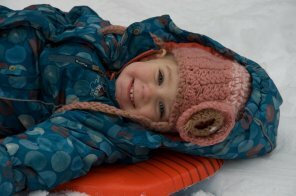 With the cold weather coming, there are frozen puddles about and the kids love playing with the ice. 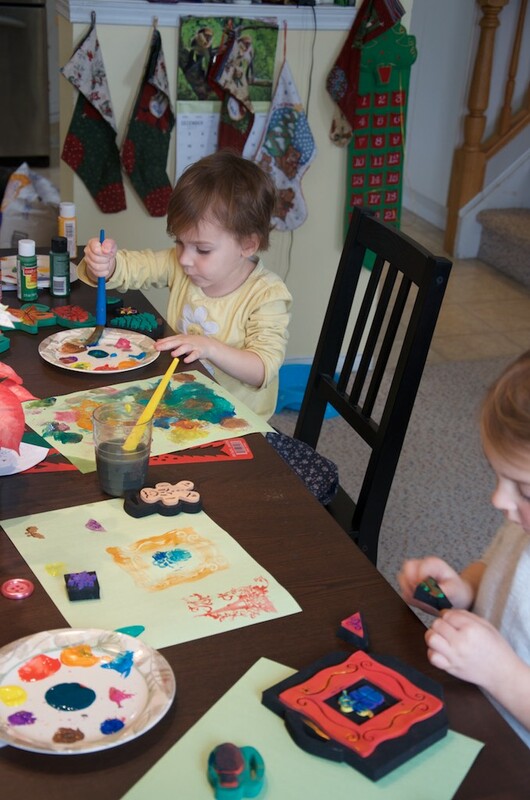 In the last couple of weeks we have made some crafts for Christmas. Pinterest is very inspiring; however, we end up with so many little projects and its hard to decide which ones to keep. 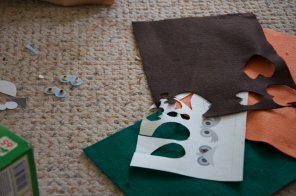 The kids and I love stretching our crafting skills as each project brings a new challenge. 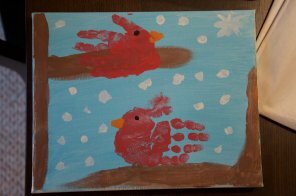 I love the hand print art the best, watching their little hands grow every year. Time goes by just too quickly. We started working on a new craft for the grandparents for christmas. I can’t give away too many secrets but there are some pictures of before its completed. 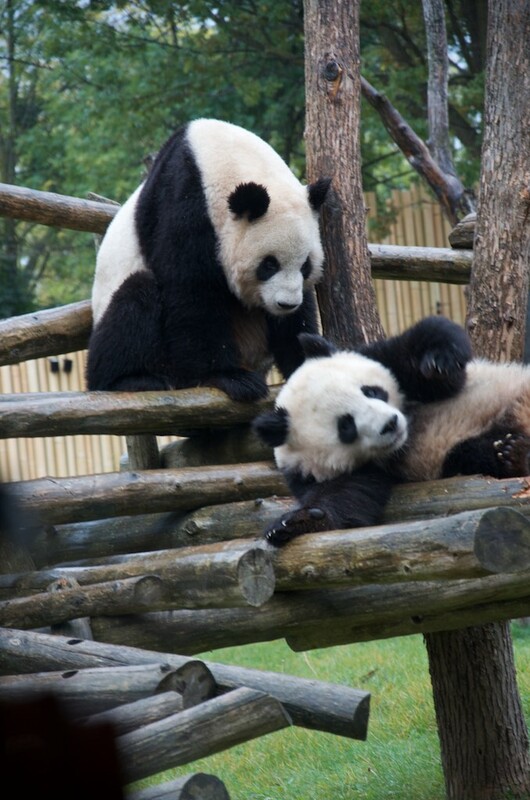 We have been rather under the weather the last couple of weeks, so we have been taking it slower. 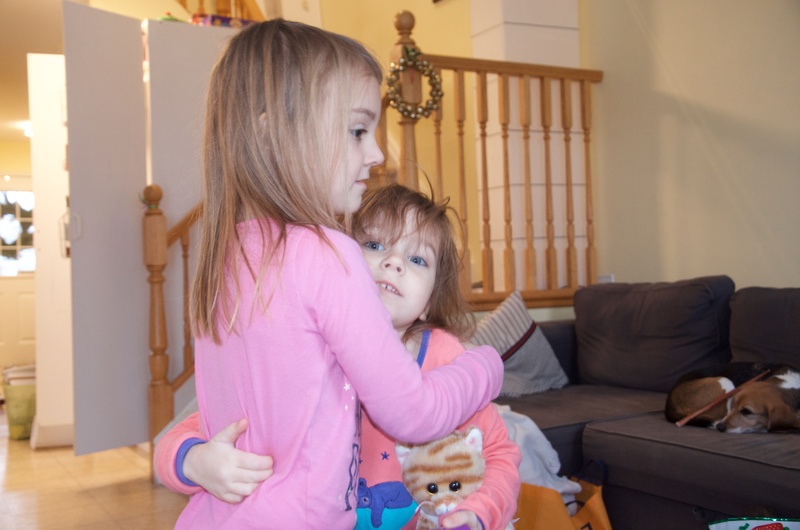 Leah was so sick that her giant stuffed Nessie suffered a flu explosion and never really smelled the same. It was old and looking rather torn so I made her a new one with a slightly modified pattern. Hopefully this one will last a bit longer. 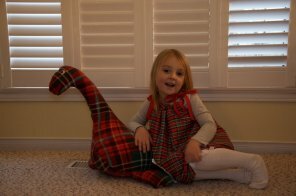 Leah and her new Loch Ness Monster. Our family grew a little bit this month, we got a new dog! His name is Hawk. He really enjoys playing with the kids and Ginger. 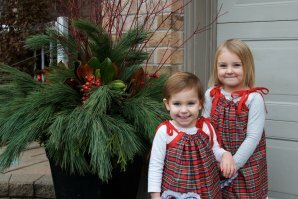 I got a a couple of christmas photos of the girls this week. I can’t believe that December is here! 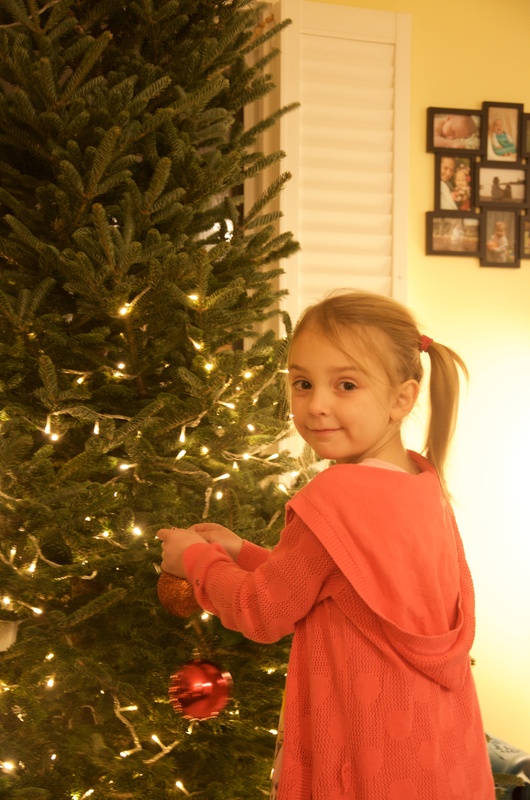 Time to get that Christmas tree up soon! 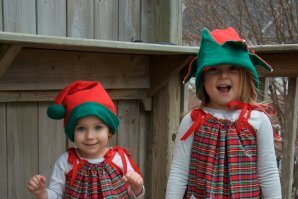 Leah and Ava all ready for Christmas. 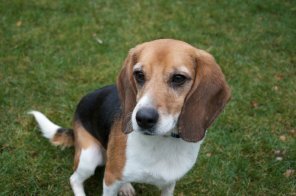 Author janamichaudPosted on 2016-12-02 Categories christmasTags autumn leaves, christmas, crafts, dog2 Comments on Saying Goodbye to Fall. Thanksgiving has come and gone, so has Halloween. 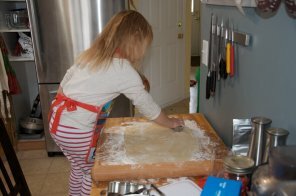 I have been very busy the last few weeks with Thanksgiving prep, costumes to make, and candy to gather. In the last bit of nice weather I got all the spring bulbs in the ground, and started tucking in the plants for the winter. There are a few things left to do, so I hope the warmish weather holds out just a little bit longer. We had our usual Thanksgiving traditions this year with a visit to The Rockton Worlds Fair, followed by a very hearty meal prepared by my father and Nick. 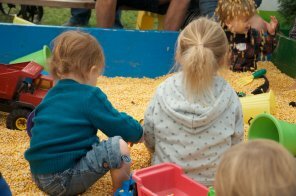 My mom and I take the kids to the fair for the day while the men stay home to cook. Leah and Ava take in as much as possible, however the rides still seem to be the biggest hit. 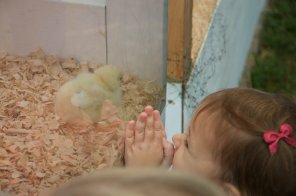 I have been going to the fair for as long as I can remember. My mom and I have volunteered in the Ag Alive tent for many years helping with the Cambridge Spinners and Weavers booth. Ava loves the horses and chicks the best and Leah seems to be more fond of the cows. 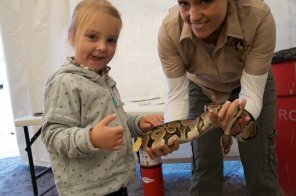 Leah built up the courage to pet a ball python, turns out she really likes snakes as well. After our busy day we headed home. I made three different desserts this year. 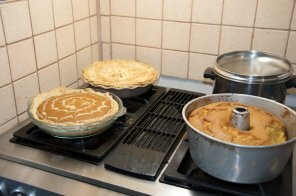 A sweet potato pound cake, an apple pie and a pumpkin pie. Then it was time to get ready for Halloween. 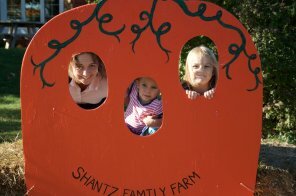 It all started with a visit to Shantz Family Farm in Mannheim, http://shantzfarm.ca We picked up some pumpkins and gourds for decorations. 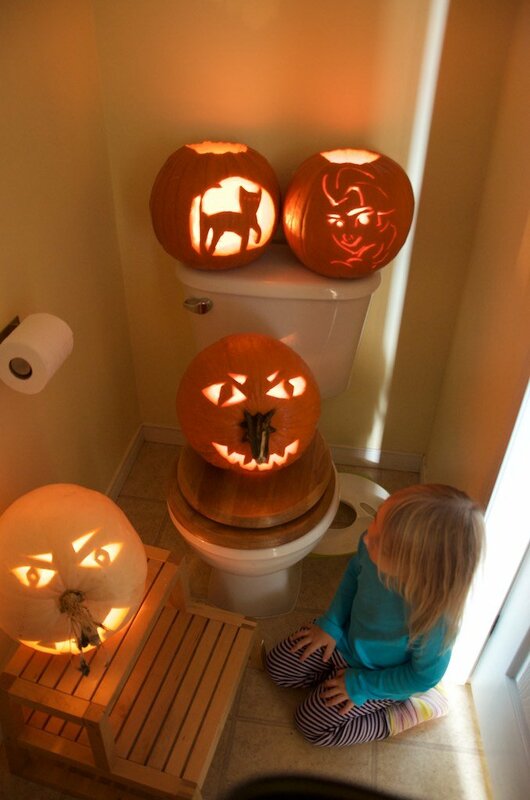 Thanks to Pinterest, I have discovered that there are so many different ways to carve a pumpkin. I tend to use a drill as my primary tool in carving now. We created two fun pumpkins and two scary faces. 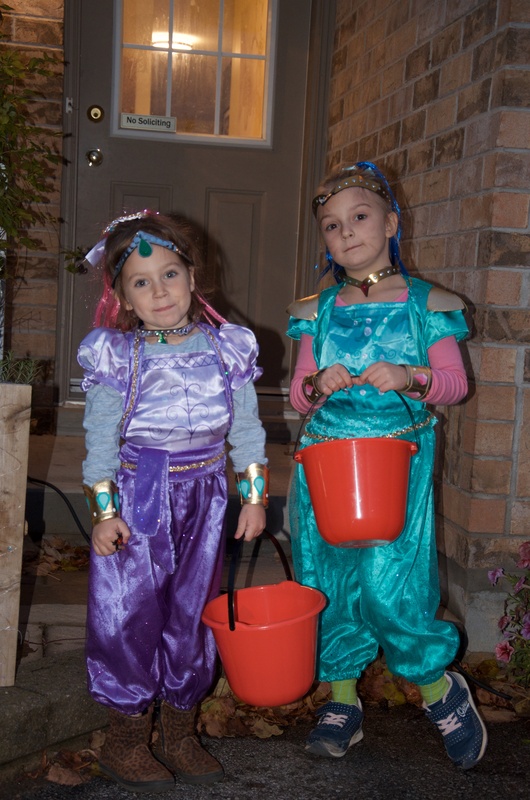 The kids were too excited to take a nice picture of costumes together. 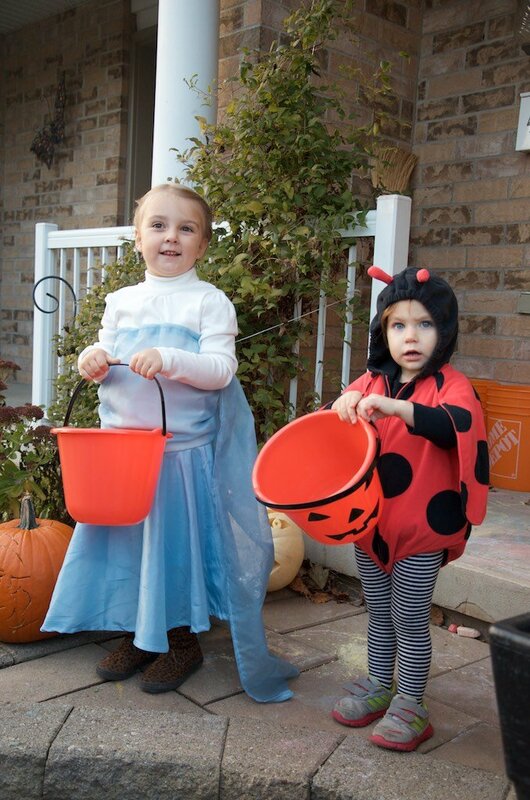 Leah was Elsa and Ava was a ladybug. 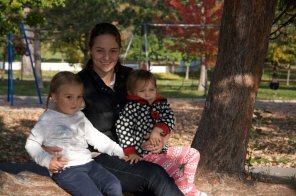 Nick was able to get a few days off the first week of November, so we headed to one of our favourite travel spots, Kingston ON. 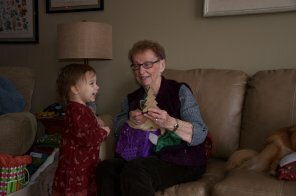 We stay with Nick’s Aunt, and visit with his grandfather. We spent a fair bit of time there over the years and have developed many favourite places to eat and see. It is wonderful to head back year after year and have it stay mostly the same. 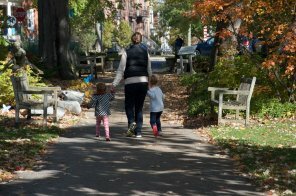 We had perfect weather for the time of year we were there, and enjoyed walking along the waterfront and playing in one of the lovely large parks that is there. Arie den Otter surrounded by Nick and his great granddaughters. 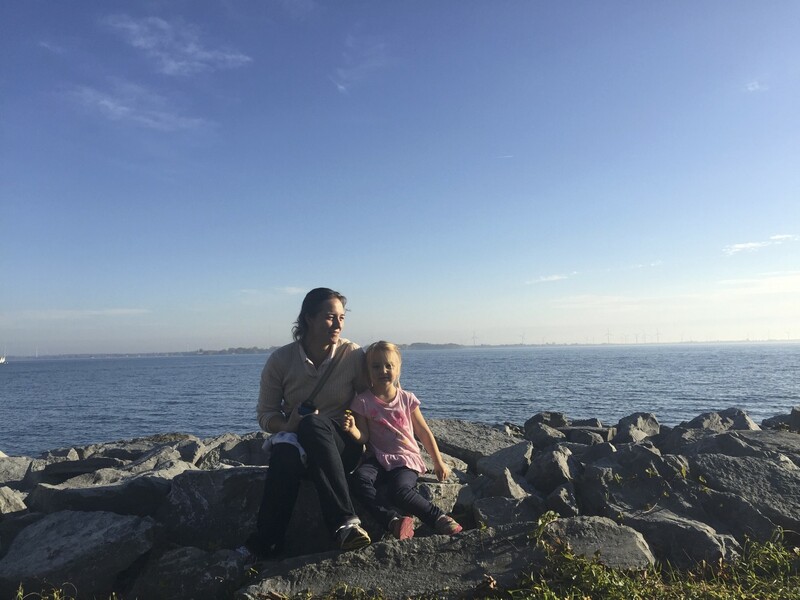 Leah and I sitting by the lake on a stunning November day. We had dinner at one of our favourite places, The Kingston Brew pub (http://www.kingstonbrewing.ca), and lunch at another, Atomica(http://www.atomica.ca). As well as a stop at Pan Chancho’s(http://www.panchancho.com) Nick and I have been eating at these places for 10 years now and they never really change. The food is always fantastic, the atmosphere is charming, with a mix of “did I really just overhear that?” and above all it brings back so many happy memories. Well here it is November already! I suppose that Christmas will come sooner than I am ready for it. My closet is slowly filling with little gifts and crafts to finish assembling. I have already heard a little bit of Christmas music and seen some windows in some shops preparing for the rush of holiday shoppers. I always hope to avoid the last minute rush, but there is always one thing or another that gets forgotten until the last moment.